Water, Cocamidopropyl Hydroxysultaine, Cocamidopropyl Betaine, Decyl Glucoside, DL Panthenol, Hydrolyzed Soy Protein, PEG-150 Pentaerythrityl Tetrastearate, Phenoxyethanol, Polyquaternium-7, Rosemary (Rosmarius Officinalis) Extract, Citric Acid, PEG-7-Glyceryl Cocoate, 100% Pure Essential Oils Of Lavender and Clary Sage. Shampoo smells wonderful! Leaves my hair clean, shiny and full of body. It is my favorite shampoo. It makes my hair soft, and my scalp is not dry like before. Makes my hair more manageable compared to using other shampoos. This is a good shampoo! My grandson has severe allergies and this works well for him. It’s pricey for the size though! I have to make sure no one else uses his shampoo. It does have a nice fragrance though the Lavender could have been paired with some thing else. However, not for everyday use because it leaves hair greasy after a few washes. Personally, lavender is one of my favorite scents, so I had to get this one, and the aroma doesn't disappoint! However, I have longer hair and it does take a few pumps for me to feel like I've gotten enough. I do like that it doesn't have harsh chemicals and look forward to trying some other Jade Bloom shampoos. My husband and I both use this shampoo every single day and love it!! Although the shampoo is thin, it's because it is made without chemicals. Commercial shampoos are thick and lather thick because of the added chemicals in them. I have found if I use a few pumps, lather, then use a few more pumps it suds up better. 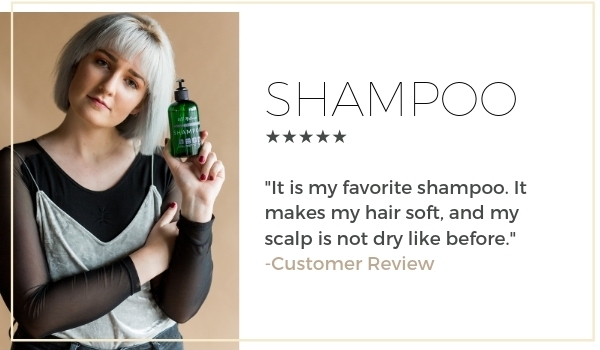 I love this shampoo and would recommend it to anyone! If you can get over it being thing and focus more on the benefits of it, you will love it!! Not to mention, it smells so good! This shampoo smells great, but it's very thin, almost watery. To get a good lather, I need about 4-5 squirts of the product. I have fine, thin hair, so I'd hate to think how much I would need to use if I had thicker hair. Also, it does build up in my hair, making it look greasy after only 1 day. I love this shampoo. It smells amazing and my hair is so clean! It's so nice to not have my hair weighed down by chemicals. I absolutely love this product. My gray hairs are no longer being stubborn and going their own direction. I really love the smell but after a few washes, it left my hair greasy. I recommend that others aren't quick to review without giving it some time as well. I use another product every other wash to combat the buildup. I love my JB but I wish this cleaned a bit better. This is the best shampoo I have ever used. My hair has never felt better even after only 1 use so far. I will never use any other shampoo again. I am hooked.